Going to Ireland is wonderful under any circumstances, but when you travel to connect with your past, it becomes an experience. “Anybody going back into the landscape of their ancestors should experience some kind of magic,” says Helen Kelly, a Dublin-based professional genealogist, but, she says, there’s “just something about” Ireland in particular. Tourism Ireland (DiscoverIreland.com/us) has even dubbed 2013 the year of The Gathering, and is “calling all Flynns, O’Malleys and Schweitzenburgs” to emphasize that “no matter how, or how little, Irish you have in you,” you’re being welcomed back with open arms. When it comes to tracing family history, those of us who live in the Wasatch Front have the luck of the Irish with the world-famous Family History Library (35 N. West Temple, 866-406-1830, FamilySearch.org) sitting in downtown Salt Lake City. The Church of Jesus Christ of Latter-day Saints has been amassing records since 1894 and has 2.4 million rolls of microfilm, not to mention digital material. What Fenway Park is to baseball or the Louvre is to art, the Family History Library is to genealogy research—and it’s right in our backyard. Before booking your flight to Dublin, hit the library or an online service to get information about who you’re looking for and where they lived. Wherever the trail leads, Rencher recommends deciding before you go “what you want to accomplish when you’re there. ... That really then sets the strategy for your research.” This could involve finding the exact dwelling where your ancestors lived, finding living relatives or even just taking in the culture and atmosphere of your heritage. In the case of Ireland, one option is to trace your family back to a home where they once lived. Fires destroyed census records from the 19th century, but excellent records, called the Griffith’s Valuation, show exactly who was living where and when. With some luck (and help), you can often find the “townland” your relatives called home. There are 64,000 townlands in Ireland—many just a few homes near fields in the countryside. 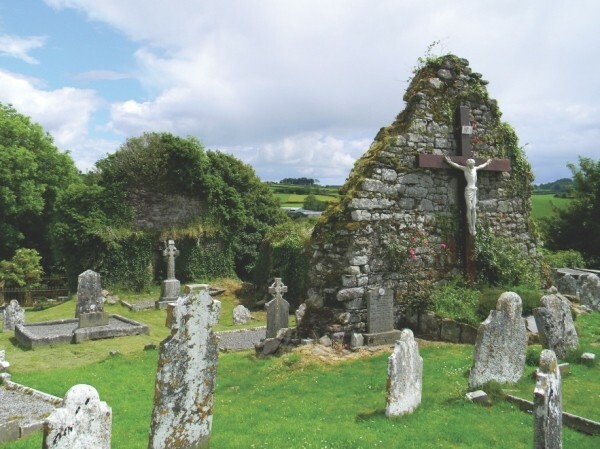 Even if you can’t find the exact home, so long as you can identify the townland, you can find the parish church where your ancestors were baptized or married and experience the same landscape they did. Even if you’ve spent time researching at home, try to work with a professional genealogist in Ireland, or one who is leading a trip there. Some of Kelly’s best advice comes in telling people how to find their way around the back roads of tiny rural townlands. No matter how much information or how many records you have, you’ll need the help of the locals. “Get out of the car and walk gently in the area,” Kelly advises. “You’ll inevitably meet somebody” who’s heard your family name. During our own Irish adventure, we found out that Irish people are every bit as friendly and helpful as they’re cracked up to be. One man who simply introduced himself as “O’Keefe” put down his pint of Guinness, announcing to the bar, “I’ll be back for this!” then hopped in his car and led us down a series of country lanes to meet someone with the same last name as our ancestor—who also happened to be the local keeper of many important records. That sort of interaction with the people still living in the very place your family once called home takes you from being a tourist to having an unforgettable experience that can only be had when you show up in the place where it all happened once upon a time. So find your McCarthy, Finnegan or, heck, even your Ramirez, and go “home” for The Gathering in 2013.